Appearing in "Finn Family Moomintroll", he is a powerful magician who travels the Universe with his flying panther, looking for the King's Ruby. 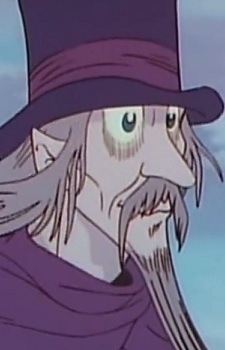 His top hat is found in the Lonely Mountains by Moomintroll, Snufkin and Sniff, who take it back to Moominhouse. Chaos ensues, as anything you put inside the hat is transformed. Moomintroll himself is changed into a strange creature by the hat when he uses it to hide in during a game. The hat also changes the Moominhouse into a sort of jungle. The Hobgoblin has a quite intimidating appearance, but is friendly. His name in Swedsih litterary means "The Wizard" or "The Magician".